Departing from my normal St. Pat's feast of corned beef and colcannon, I decided to splurge this year in a different vein, simmering Irish Stew all day in the crockpot, its dark earthy Guiness beer tones enhancing another splurge at Harter House-- lamb! As even more of a culinary feast, I whipped up roasted garlic with rosemary, right-off-the-plant in the sunroom, dumplings to grace the top o' the pot. Happy St. Pat's Day Y'all! Our St. Paddy's feast consisted of broiled lamb chops with my FAVORITE: chimichurri sauce, and a sort of colcannon recipe by way of Louisiana. It's an Emeril recipe with all the right ingedients but mixed up a little differently. My husband likes potatoes, kale (cabbage), and bacon, but not all mixed together in his mashed potatoes. That's sacriledge in the Church of Gene, who by the way is, like George Carlin, a frisbyterian. He believes that when he dies his soul will go sit on the roof and refuse to come down. So I'll leave his mashed potatoes chaste and for another day but for tonight we're eating potatoes and cabbage. I found a great Emeril recipe that I will be making again and again, basically it's potato and cabbage quarters roasted with a topping of bacon and onion. And yes, it is every bit as good as it sounds. Pork fat does indeed rule, although I admit I just couldn't allow myself to cook a whole 12 oz of bacon for this dish and limited it to 6 slices which is still bad enough. But what the heck. It's a holiday. 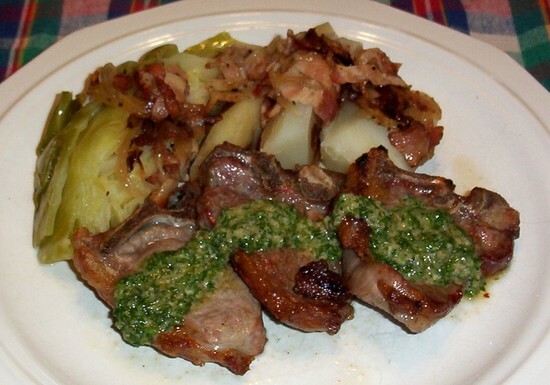 The lamb chops are simply broiled to medium and topped with chimichurri sauce. Both the recipe for it and the Emeril recipe are after the jump.